WELCOME to soul in Scotland on the internet. if you have a soul night planned, just email me. Around 100 dates for 2019 are now on the calendar, let me know if I've missed anything. 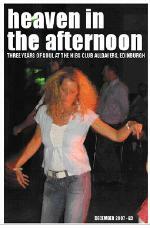 The last few copies of Scotland's first soul book, Heaven In The Afternoon, are now available - it's a 24-page full-colour book of 40-plus photos taken by myself at Hibs Clubs Alldayers in Edinburgh over the last few years. You can order a copy via email for £4 (including post and packing). Just email me if you want a copy. Paul Massey, Paisley, April 2019.